Well, here we go again. At Coldwell Banker Select, we like to think of ourselves as “Technologically Advanced”. Fancy term for simply providing the latest tools to our agents to help them grow their business. The latest development to our HomeFacts system does just that. 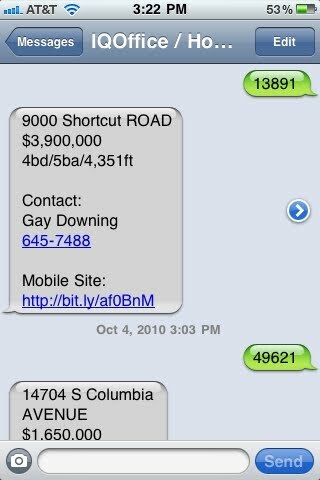 You can now TEXT the property code to (918) 990-0660 on your phone and receive a text message back with the basic information on the property, the listing agents name and contact info, and a link to the property listing on the agent’s mobile website. The agent will be notified with the consumers phone number, the address of the property, and whether it was a text from the yard sign, Select Living, or whatever the source. Pretty slick. Even if you call the number, it will let you put in the code, just like the normal HomeFacts number. The nice thing is when the consumer clicks on the mobile site link, they get to see all of the photos of the property. It’s a great way to drive someone to the agent’s mobile site, without having to do a lot of advertising.